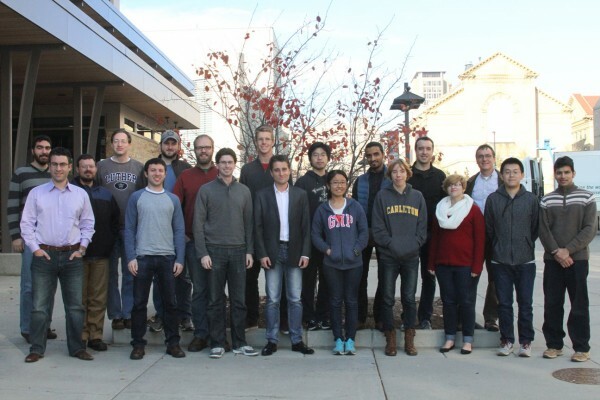 Back (from left to right): Alper Sarikaya, Nathan Mitchell, Michael Doescher, Christopher Bodden, Brandon Smith, Eric Alexander, Haixiang Liu, Amin Alhashim, Sean Andrist, Michael Gleicher. Front: Eftychios Sifakis, Danny Rakita, Adam Sperling, Tomislav Pejsa, Chih-Ching Chang, Erin Winter, Deidre Stuffer, Ming Gao, Mridul Aanjaneya. Lab photo taken 11 November 2015. UW Graphics Lab, part of the Department of Computer Sciences at the University of Wisconsin—Madison.